Doctor Who: Companion Pieces - ROSE TYLER | Warped Factor - Words in the Key of Geek. Tony Fyler welcomes a new bloom. If Doctor Who was going to work in the 21st century, it had to do many things – it had to re-establish all the great storytelling and moral lessons of the past, but it also had to redefine certain things to work in a new, modern way. Possibly erroneously, 20th century Who had always been seen as a ‘boy’s programme’ because the Doctor was always the cleverest person in the room, and the companion – usually, indeed overwhelmingly female – was often blatantly there to give ‘the dads’ something to look at after the football. She was someone to be the Doctor’s ‘best friend’, but never, quite, his equal (despite some brave stabs in that direction over the years – Lady Romana, we salute you). If the show was going to be a hit in the 21st century, that had to change, and that would depend on the companion. The companion had to be us, yes, absolutely – ordinary old us, swept away on the adventure of time and space and the wonder of it all – but she also had to be possessed of enough sense of self to tell the Doctor he was being unreasonable. To slap him down if need be, and to save him when it was necessary. She had to make the journey from ordinary old us to citizen of the universe, proving to us that time with the Doctor changed you – changed us – for the better. Right from the very start, the idea of Rose Tyler seems to have been that her circumstances were ordinary, but that, given the right opportunities and inspiration, her personality could be so much more than that. That very first montage of her day shows exactly the rut in which she finds herself – living with her mother, working in a shop, having chips with her goofy boyfriend for whom she’ll probably settle. But then, by accident, she encounters the extraordinary – the Autons – and meets the Doctor, and immediately, she’s running. Running from danger, yes, but running, too, from everything mundane in her life. Not that she immediately lets the Doctor get away with anything – it’s Rose who demands he justifies his actions, who first treats him as though he’s a mad man with a box, and who calls him to account for his alien detachment when he forgets those he regards as the ‘little people’ – which includes Mickey the goofy boyfriend. It’s telling that at the end of the first episode, Rose can’t bring herself to leave Mickey behind and go on the adventure the Doctor promises until he mentions it also travels in time. Rose is up for the adventure, yes, but she’s also got what she feels are responsibilities. But the possibility of time travel opens up an opportunity she can’t turn down – the chance to see her dad, alive, well, walking about. The chance to get to know him. That, as much as anything else, is what turns Rose into a companion. When Doctor Who came back in 2005, it was inherently a darker thing than it had ever been in the Classic era. Eccleston’s was a post-war Doctor, a survivor-guilt interpretation who also remembered the hardest days of his life – days that hadn’t happened the last time we’d seen the Doctor. The Eccleston Doctor was ‘an idiot, with a box and a screwdriver, passing through, helping out, learning’ but more closed up and closed off than ever before. It’s Rose who actually brings back the qualities of the Doctor that the Classicists had always admired – the good man, dedicated to making a difference. In Dalek, it’s Rose who brings an untarnished view of the Dalek, and who stops the Doctor finishing the Time War when he picks up a gun. In Father’s Day, Rose’s ache to interact with her dad causes lethal mayhem, but it’s the journey she has to take. And when the Daleks return in force in Bad Wolf and The Parting of the Ways, it’s Rose’s refusal to give up, and her determination to live up to the Doctor’s potential of being better than work and sleep that turns her into the Bad Wolf, that makes Captain Jack immortal, and that finally teaches the Ninth Doctor what he seems to almost want to forget – the power of self-sacrifice. In saving her, he pays tribute to the salvation of his essential nature that Rose Tyler – ordinary little Rose Tyler from the Powell Estate – has brought him. She’s acted as the mirror not of what was on outward display, but of the inherent spirit of the Doctor, and she’s lived it – essentially, she’s been the Doctor, when the Doctor had almost forgotten how to be, and by being in her reflection of himself, he remembers how to be The Doctor, saving her at the cost of his own life. Then, with a fireworks display unlike anything she’s seen before, the Doctor changes into a grinning, stringy chatterbox, and Rose’s relationship with him changes too. Fortunately, Rose has her mum to hand to help her through regeneration-observation trauma, and in this most crucial time – just as she did when Rose was stranded without the man she clearly loved – Jackie Tyler proves herself a fierce, tender mother, helping her little girl come to terms with the way people change in life and what you have to do to support them. Once the Doctor recovers from his post-regenerative nap and hand-loss, they’re off again, running to meet the universe head on. This time though, there’s a freedom, a kind of joy to their relationship that sometimes borders on the smug – and sometimes kicks the borders in and goes straight there. While with the Ninth Doctor, she convinces herself that her relationship with the Doctor is ‘better than that’ – better than the commonplace partnerships she knows about between humans, with the Tenth, the bouncy, bright-grinned, ‘Oh, yes!’ Tenth, Rose begins to envisage ‘that.’ Just that – a full, involved, committed partnership, born in fun and friendship but maybe growing to more. It’s a notion that’s knocked skewiff when they meet Sarah-Jane in School Reunion, and the ‘burden of a Time Lord’ becomes properly clear to her, and is dampened further when Mickey, the goofy boyfriend who was never invited suddenly comes on board to spoil her freedom and her fun. When he stays behind in a parallel universe to help save the world from Cybermen, Rose is sad to lose her friend, but it’s clear that their relationship had normalized on that level – they’d never have fitted together once the Doctor came calling. From there, Rose’s development is very much played one day at a time – we understand that she and the Doctor have a special relationship, but quite what it is, neither she nor we are entirely sure. Rose the Earthgirl is an adventurer enjoying her adventure, but she’s in an emotionally untenable position, loving a 900-year old man who’s incapable of loving her back. 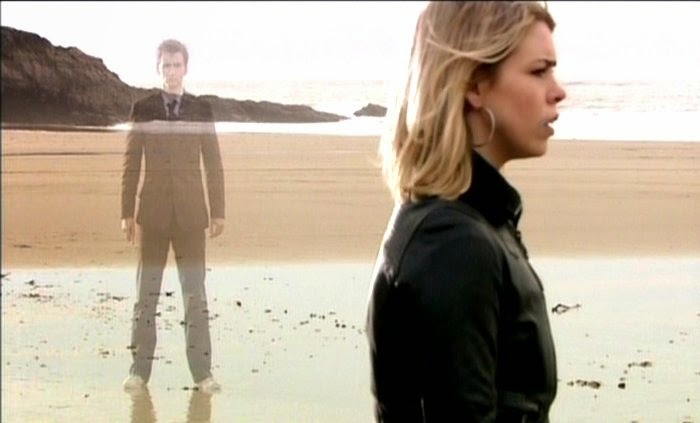 When Doomsday comes, and the two of them are separated by the walls of reality, she gets so very nearly to hear the words she’s needed to hear – that her Doctor loves her too – but which he’s been unable to let himself say when there was a chance of going forward together, unable to face the pain of loving and losing her. And there, perhaps, the story of Rose should have started again – with her stranded and love-lorn in her parallel dimension, fighting the Doctor’s fight because he couldn’t be there. When reality starts collapsing though, Rose knows what she has to do. By then, she’s explored her potential, and is not afraid to do either what the Doctor would do, or what, ultimately, Rose Tyler would do – she’s quite prepared to stand by her own name in the universe. She maps probabilities, travelling from world to world to find both the man she loves and, coincidentally, the man who can save the multiverse. At the end of that adventure, the Doctor as he has become, having moved on, met Martha, and established a less emotionally intense friendship with Donna, still can’t say the words she needs to hear, for new reasons. But the Metacrisis Doctor hasn’t had those experiences – he’s freshly born into the universe from the Doctor’s hand as it was before School Reunion, before the impact of his feelings for Rose had made itself felt. And of course he can grow old and die – the miracle cure for the Doctor’s Time Lord biology, found. So that, ultimately is Rose Tyler – the ordinary girl who grasped the opportunity of the universe, and let it open her up, find her love, and loss, and grow her into a woman, rewarded with the love she needs and the life she deserves. She’s the girl who ran towards the wonder of time and space and showed it to a new, 21st century audience, ensuring Doctor Who was still relevant in an age of companion-equality.